Club Penguin Cheats by Mimo777 Club Penguin Cheats by Mimo777: Screenhog Talks Fair Games! The Fair will only be here through the weekend, so we need get all those prizes! Don't forget there will be more prizes soon, so be sure to check back. Have you found all these things at the Fair? You haven't? Well get out there and find them! Mimo I met you and Me Santa on Winter Land at the migrator. I added you both but you didnt add me back. You said you would add mods. Awwwwww! I can't find it either. It looks like a black puffle head underneath the white on though. The first one is with the black hat is the game Puffle Shuffle at the dock.The second one is a stamp from ur stamp book with the snowball arrow.the third one is with some of the mullets body it the game called Memory Card Game at the beach.the fourth one is at the circus when the orange puffle is preforming in the car.the fifth one is with the snowflakes is the cape for the magic person inside rock hoppers ship when u buy it.and finally the sixth one is with the white puffle is.. umm OMG! WHEN I CLICKED MY BACKROUND I SAW ROCKHOPPER HAT AND IT HAD THE WHITE PUFFLE! YESS I FOUND EVERYTHING! - Mikala2000 its with not Y okay! good job you aced the puzzle. Well, to add him, you must be at the Mod list or maybe mimo's friend list is just full. do u just walk to them? Thanks Mikala2000! 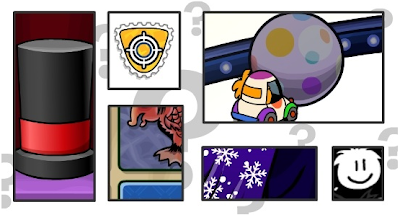 I have been searching for the white puffle on black background for ages now! Does anyone else here play poptropica or Planet Cazmo anymore?? I do! the white puffle one is on rockhoppers hat at ski vlillege. the bottom is his eyebrows! (the one where he is waving with yarr next to him) hope that helped! the mullet is from aqua grabber, the hat is from the hat game, the white puffle on the hat is from rockhoppers pirate hat, the clown car is from the puffle circus...the orange puffles act, the pin is from the 50 target at a party pin...in the stamp book, and the snowflakes with the blue backround is from the blue magicians cape from rockhoppersclothing menu....there u go eery one of those items!! !